We have pair for sale, which is believed to be NOS. PRICE FOR THE PAIR: 420 Euro, with guaranteed Test Data. 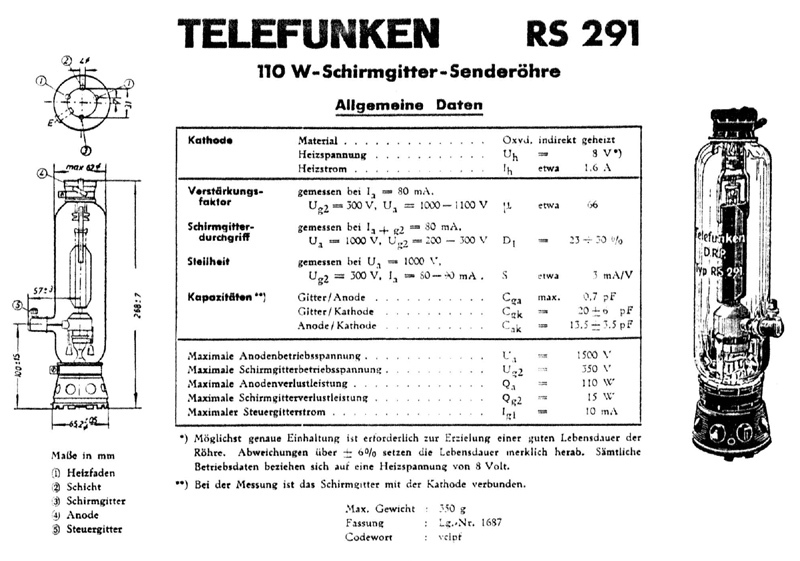 ATTENTION: Some people offer those matched on Telefunken W19. This tester can only test for emission, and basic function, but it will not produce a transductance number. However, Funke W19 can not test for dynamic tube parameters, so for HiFi matching, the W19 can not be used. So to say it again, you can have two tubes which test identical on the W19, it only means they have seen identical use. This does NOT mean, they are matched, so bias, transconductance, plate impedance can be, and probably will be different. As transconductance is already different with unused tubes, and it becomes really different with used tubes. Good examples of real matching, you find below here. This is a very nice tube for HiFi purposes. The Japanese like to use tubes like 211 and 845, which are transmitter tubes also. The RS291 is certainly not the same. It is better! The datasheet of this tube is for tetrode connection, because that's what this tube was originally intended for. However, for HiFi you should use this tube triode connected, which means you just connect the second grid to the anode. There was never an official data published for this. Actually this a VERY nice HiFi tube. To have no mistakes, the original datasheet is Tetrode mode. 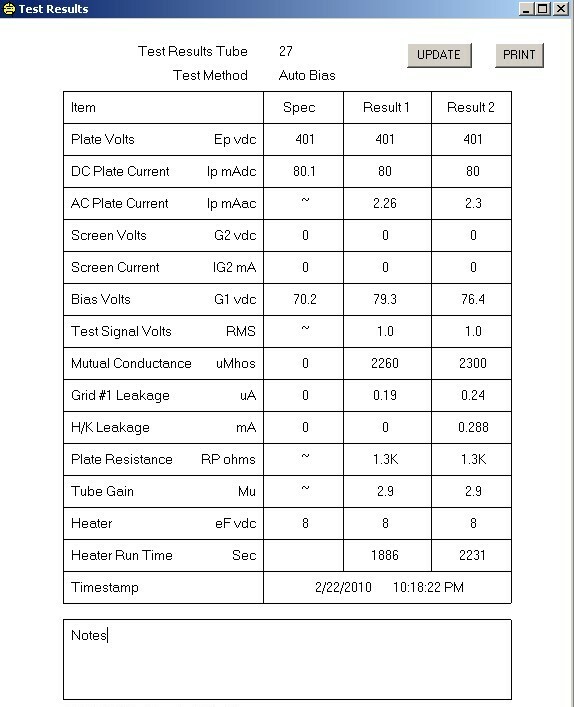 The test report that comes now, is in Triode mode, and I did so for BOTH TUBES TOGETHER in one sheet. This appears to be a perfectly matched pair. What do we see from this report? This is a HUGE 45 tube if used in triode mode. 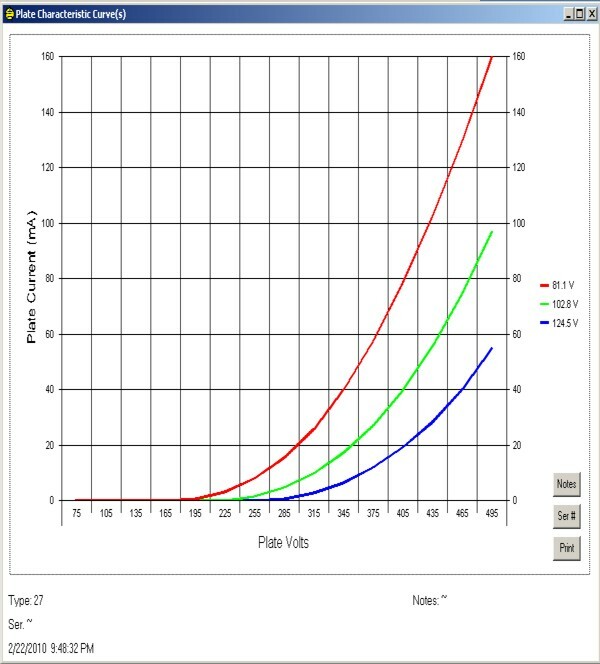 All data is like the 45, only the RS291-Triode-mode runs at a much higher operating point. You will see the excellent matching of the pair. I have set the tubes for a normal HiFi value of 400 Volt, 80mA. As you can see that produced a bias of 79.3 Volt for tube #1 and 76.4V for tube #2. Bias: In real autobias circuit, the tubes will bias the same way, each at 80mA exact. So bias at 400V/80 mA is just what I used at the tube tester, not stressing the tubes and the tester. However the crazy thing is, these are 110 Watt triodes. :) So at 400V/80mA they got only warm, but not hot. Actually if you try it, you will see the 45 bias point fits somewhere on those curves too. You should bias them somewhere like 480V 120mA. Gain. It is coincidence, they did not think of this TFK of course, but the Triode gain is very nice, the gain is 2.9 for each tube. The low gain of 2.9 will ensure low distortion. Impedance, Gain and transconductance Is the same a the 45 tube.